Extremely tasty and tender cake, consisting of almond biscuit Gioconda, raspberry mousse and raspberry jelly from the famous Japanese confectioner Hedemi Sehin and my addition in the form of chocolate mirror glaze and chocolate decorations — gift to all lovers on the day of St. Valentine! Soak gelatin in cold water. 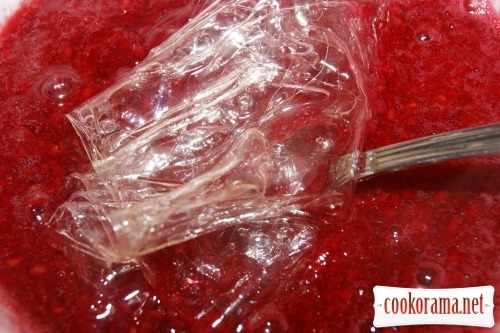 Heat 100 g of raspberry puree and dissolve in it sugar and squeezed, swelled gelatin. Put in form 25 сm in diameter, covered with food film. Let it cool and freeze it. 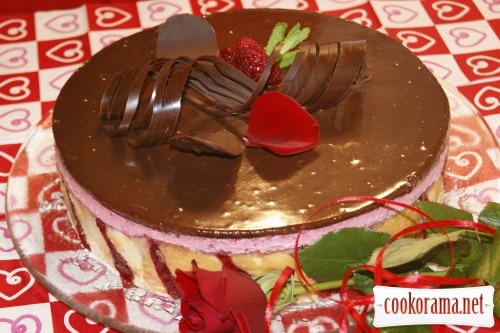 It is best to cook the day before, to let the biscuit to «mature ». Mix almond flour with powdered sugar. If you do not have almond flour, you can cook it yourself — grind peeled almonds and powdered sugar together in a blender. Add white (40 g), yolk and mix into fluffy smooth mass, then add in 2 stages flour and stir by compiling — from the bottom up and around. 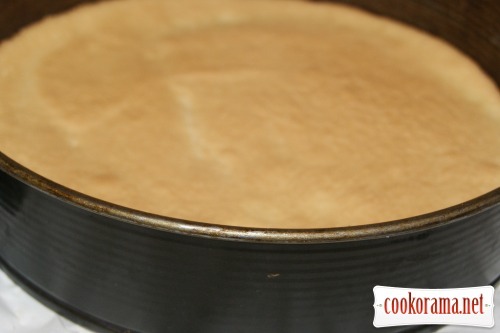 Mix whites (50 g) with sugar powder into stable peaks and in three steps connect with almond-flour mixture by compiling — from the bottom up and around. 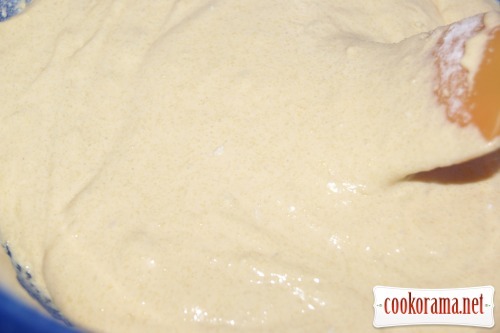 That`s how ready biscuit dough looks like. 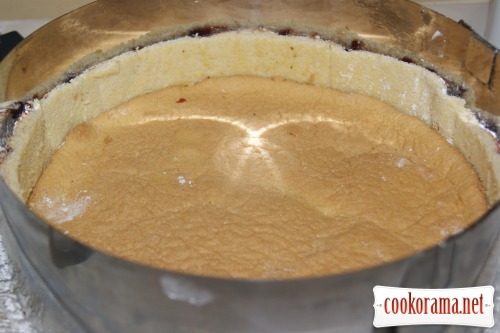 Put in a pre-prepared form, bottom of which is covered with baking paper 1/3 part of dough (layer not thicker than 1 сm.) and bake in heated at 220℃ oven for 8-10 min till golden color. Let it cool and remove from form. 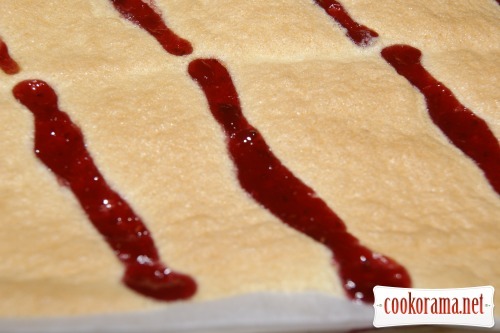 Spread rest of biscuit dough by thin layer on baking sheet (25х35) covered with baking paper and dividing it mentally (you can make thin strips with knife) in 4 parts make inclined strips of jam, which is placed in a cooking syringe (package) with a very fine tubular nozzle. Bake in heated at 220 ℃ oven for 8-10 min till golden color. Cool ready biscuit. 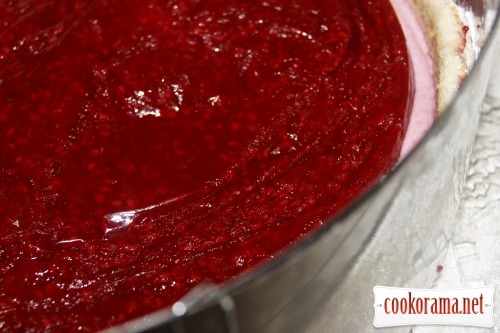 Do not be afraid that strips with jam melt away, by maturing of biscuit they`ll seize. 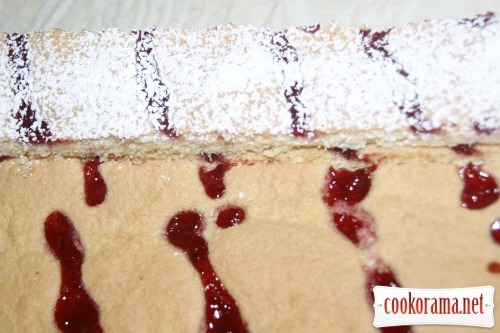 Cut cooled and «matured» biscuit in strips of 4,5 сm high and length, which will correspond to the length of the ring volume (form), which will assemble cake (I have a sliding culinary ring of 28 сm in diameter) and very generously sprinkle with sugar powder, for jam strips not to stick to form. 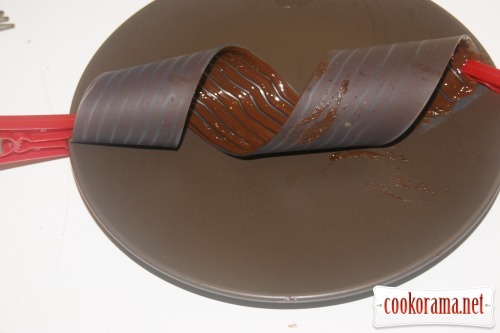 Place biscuit strips round the form (pattern to form), place at the bottom round biscuit. Soak biscuits in from with syrup. 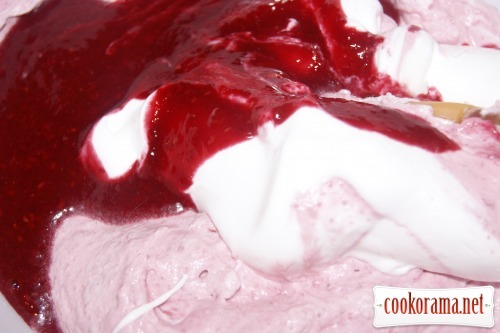 Prepare Italian meringue. Place water and sugar in a saucepan and cook at 117 ℃, if you do not have thermometer, then to soft ball. 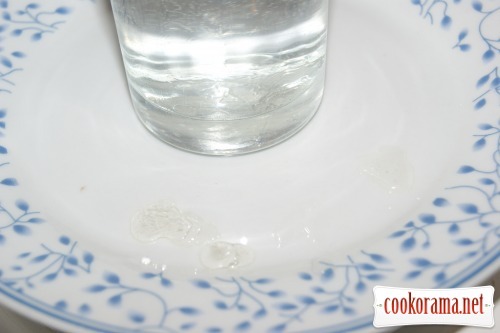 Drip syrup on the plate and let it cool, try with hands or drip in glass of cold water — can be seen as the ball floats. 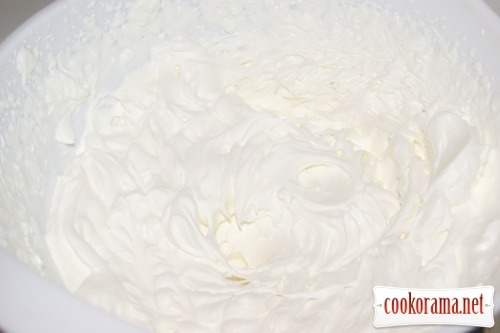 In parallelwhisk whites in thick foam. 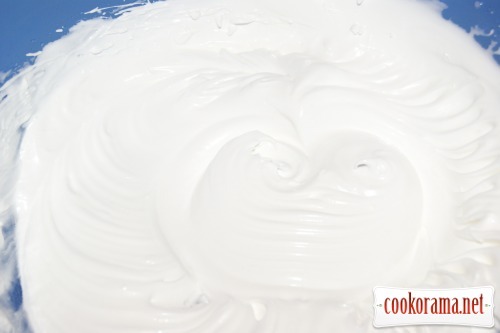 Add finished syrup in whites, constatly mixing, beat until the meringue has cooled, it should be smooth. 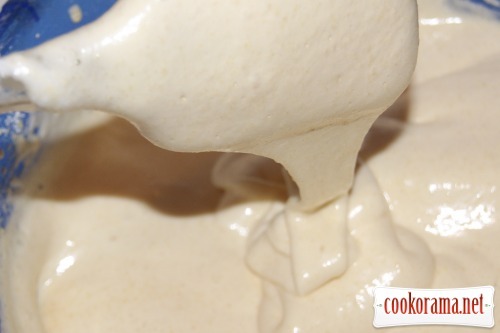 Mix cream into soft and stable peaks. 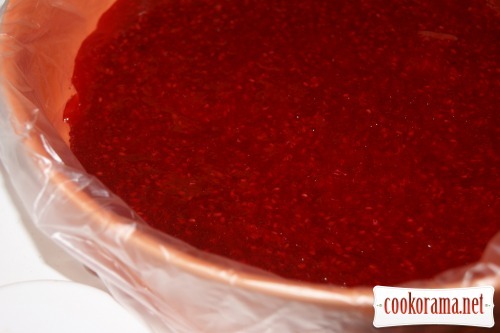 Heat a bit of raspberry puree and dissolve in it previously soaked in cold water and squeezed gelatine, combine with the rest of puree and stir. 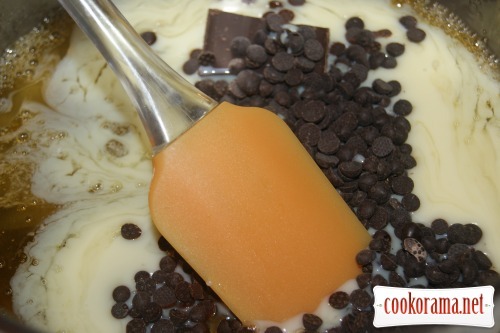 Connect using spatula and in three portions, adding parts and stirring — puree, cream and meringue. 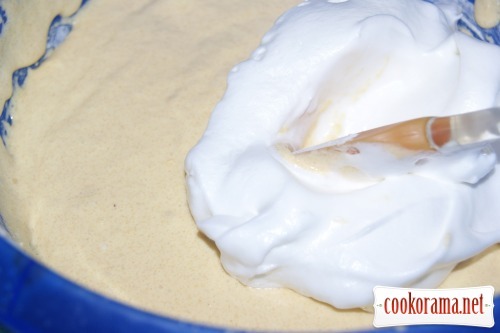 Stir mousse well, to get smooth mixture. 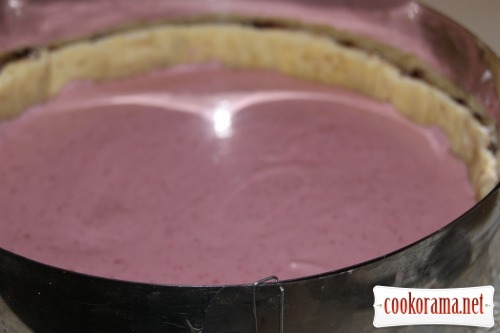 Fill form with mousse in half of side biscuit. Put in the fridge for 20 min. 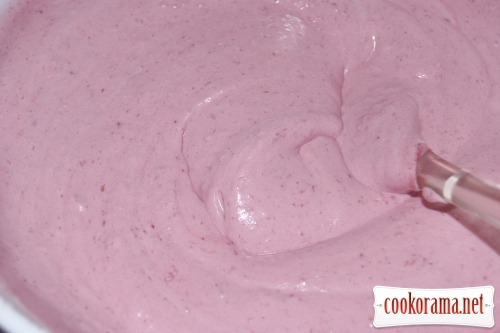 Put raspberry jelly on slightly frozen mousse. 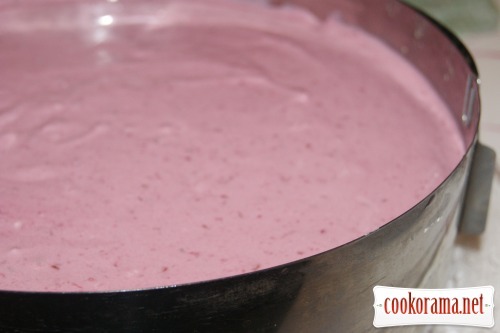 Top with rest of mousse and put in the fridge for 3-4 hours. 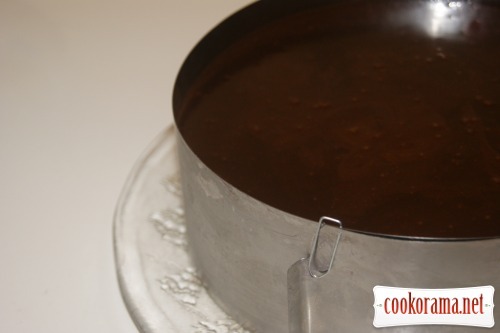 Heat water, sugar and honey to a boil and cook for 2 minutes, remove from heatadd condensed milk and chocolate, stir well, without raising spatula highly, not to form air bubbles. 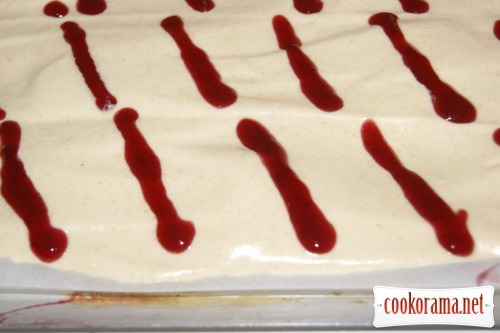 Cool and pour on the frozen surface of the cake, do not straighten! Glaze should spread about itself! 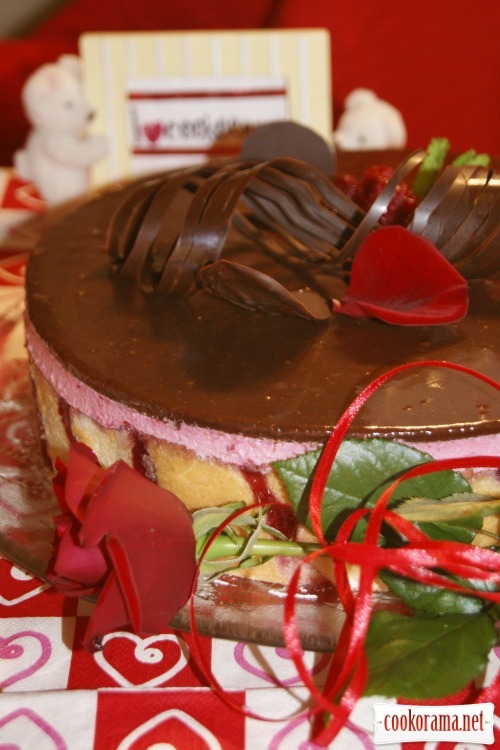 Place the cake in the refrigerator. 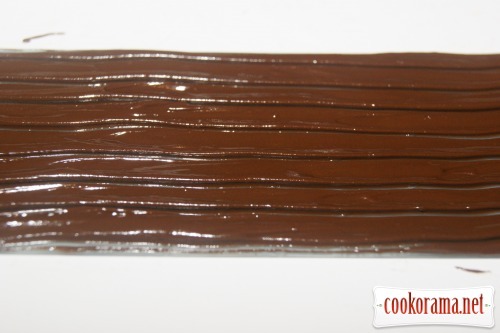 Put the melted chocolate on silicone strip. Make grooves using a special comb or fork. 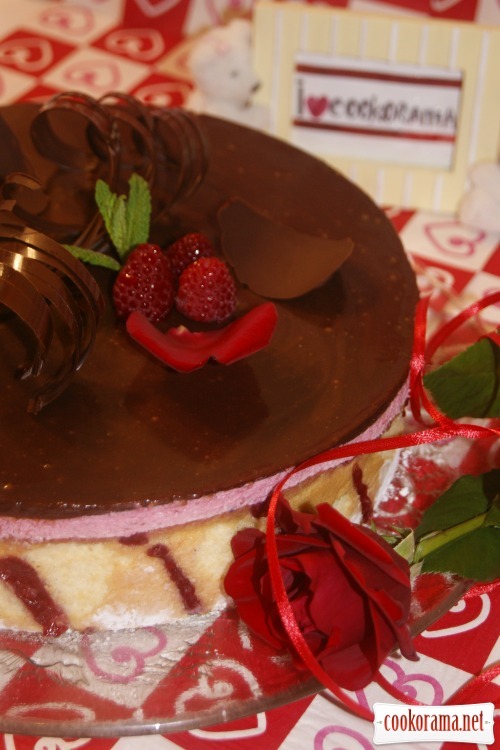 Fold in spiral and place in the fridge, free from the strip directly on the cake. 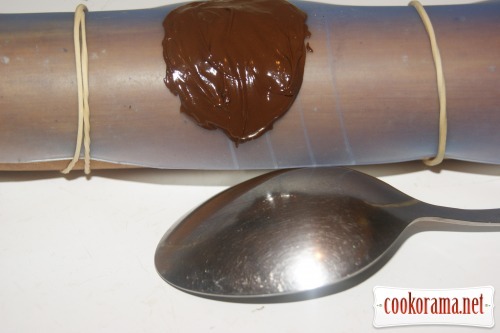 Put melted chocolate on silicone strip fixed on curved surface (I used rolling pin ) let it freeze in the refrigerator. Remove from form before serving, heating sides of it with hot hairdryer. 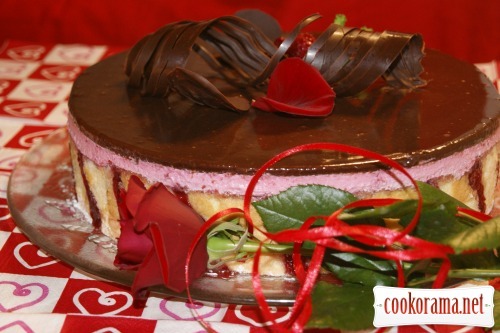 Decorate cake with raspberry, mint leaves, chocolate chips and spirals. 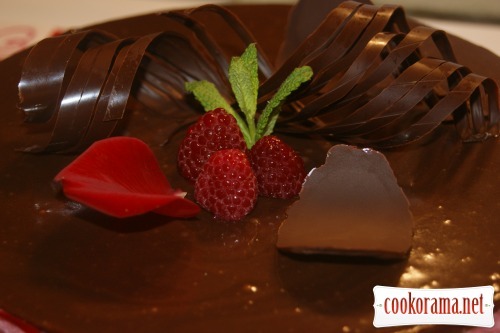 Cut cake in portions with sharp knife, which was dipped in hot water and dried! 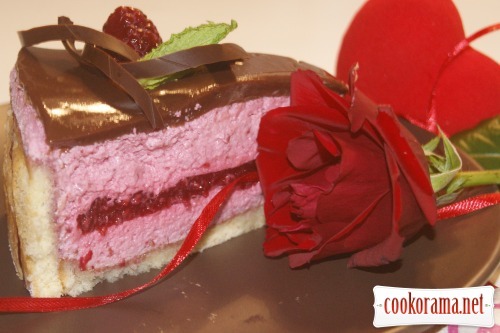 Top of recipe "Cake "Raspberry euphoria""
Ната, ця спіралька — просто філігранна робота! Оль, спасибо большое!!! Я очень люблю украшения из шоколада! Фантастический торт!!! Я добавку попросила. спасибо, Ларочка! факт добавки подтверждаю! Класс!!! И торт, и пошаговые фотографии! Натик, про торт скажу — произведение кулинарного искусства!!! Ничего не засмущала — что правда, то правда . какая начинка !!! суперский торт! сегодня просто парад десертов! спасибо, Настя! точно, один лучше другого!!! Бесподобный торт! Очень изыскано украшен! спасибо, Мила! всё в наших руках! Супер тортик! Відчувається святковий настрій. спасибо, Дана! так ведь праздник !!! я не знаю какую эйфорию сотворил знаменитый японец, но Вы сотворили маленькое кондитерское чудо! у него пирожные и назывались они — Розовые фрукты, насколько я смогла правильно перевести!!! Спасибо, Оксана, мне очень приятно! Який гарний, смачний і фантазійний торт! Якщо можна, мені шматок побільший! Должно быть, вкуснятина невероятная!.. Очень красиво и аппетитно! о, да, вкуснятина!!! спасибо большое!!! Очень красивый торт — мне нравятся украшения . Вобще торты, десерты и всякие сладкие штуки у меня больше ассоциируются с романтикой и днем св. Валентина . 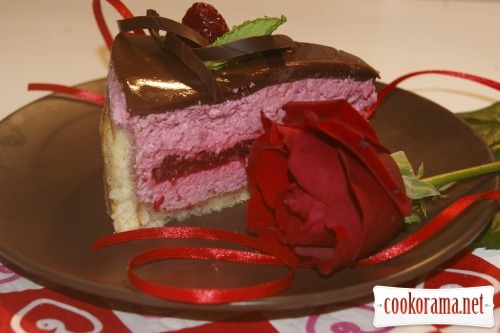 Recipes, Cakes, Cake "Raspberry euphoria"